Headway is the UK-wide charity that works to improve life after brain injury. Through our range of front-line services and network of over 125 groups and branches across the UK, we provide support, services and information to anyone affected by brain injury as well as professionals working in the field. In 2004, Marc Almond had a motorcycle accident that left him with multiple fractures and a brain injury. He was in a coma for two weeks and spent the next two years relearning lost skills, including singing. To show his support to others who have experienced brain injury, Marc has become an invaluable supporter and ambassador for Headway and kindly donated this VIP experience to help us provide our services. 80's legends, Soft Cell, have announced they will be reuniting for one final concert at The O2 Arena, London on Sunday 30 September 2018 to mark their 40th anniversary. 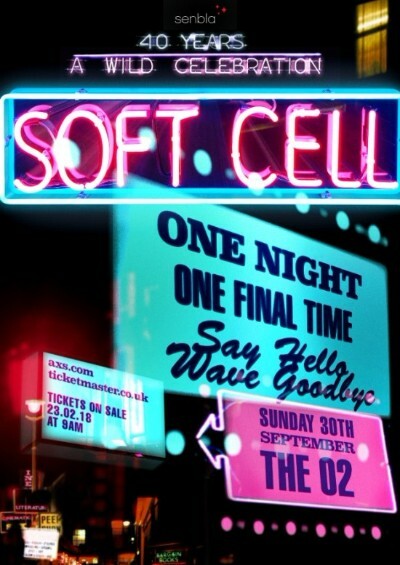 This is your chance to win two VIP tickets to 'Say Hello, Wave Goodbye', Soft Cell's last ever show!